One of my fave Spring/Summer 2012 lines was Dolce & Gabbana’s, with its culinary vegetable inspired prints. This dress in particular caught my eye: a full-skirted dress featuring a bold eggplant print. Dolce & Gabbana Eggplant-print Dress, S/S RTW 2012. Photo from New York Magazine. At almost $4,000, this dress is just a *tiny* bit out of my price range. 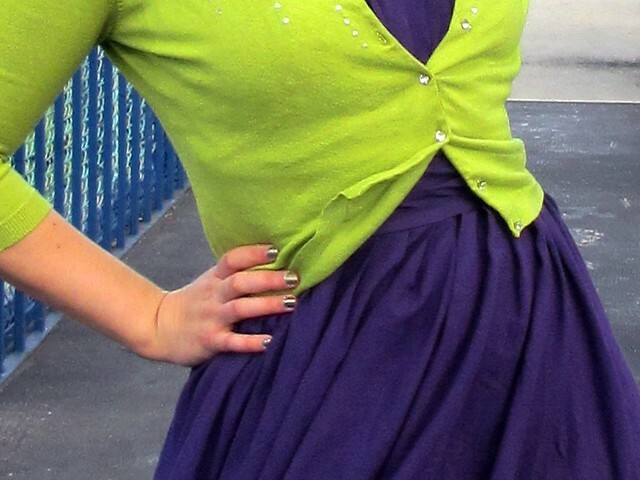 But I used the color combo as inspiration in putting together this outfit: a purple dress with a lime green cardigan. The dress is one I got awhile ago from ModCloth but never wore because it was super low cut and too big in the top & waist. But I’ve always loved the full skirt, so I ran it through my sewing machine to take it in & make it more wearable. I bought the sweater from Express ages ago, and love wearing it when I feel like being a little flamboyant. It’s got shimmery sequins and seed beads, plus fabulous rhinestone buttons. Oh, and the nails: I subscribed to Julep Maven in February and I’ve been having fun playing with nail polish again! This was a shimmery dark blue (“Marisa”) with a coat of gold glitter (“Oscar”) on top. I didn’t get a good shot up close, but it had a cool effect when viewed from afar. So, where are you getting your outfit inspiration this spring? 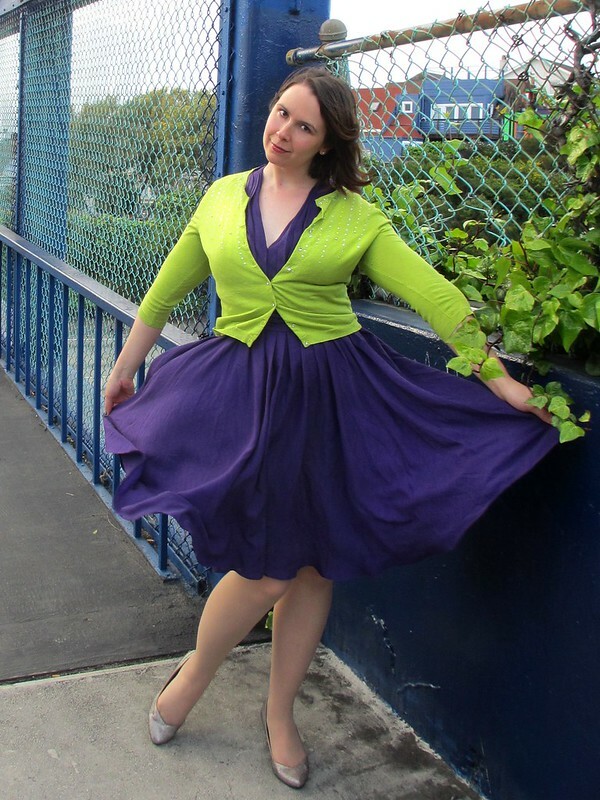 Sunday, April 8, 2012 kate à la mode	BC Shoes, Cardigan, Color Blocking, Dress, Fashion, Green, Lime, ModCloth, Potrero Hill San Francisco, Purple, Silver, Sparkly, T.A.G. ahh I love the Dolce and Gabbana dress I saw it appear in my Glamour magazine. You did a great job inspiring your outfit from that dress. It looks so good! I absolutely adore that D&G dress. And thank you! First of all…that gorgeous sheer eggplant dress took my breath away…what a beautiful, beautiful collection!!! Hits me right at the heart :) ANd your interpretation is a great alternative with the same gloriously full skirt and vibrant colours, but much better daily-wear styling! 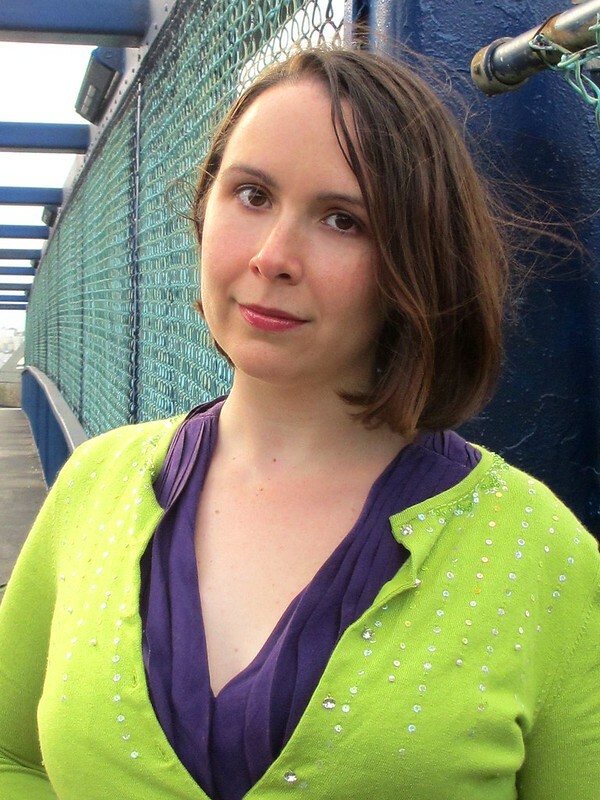 Love your blog so much, it’s great! What a great place to take photos! I like your interpretation of the color scheme. It makes me think I need more purple in my wardrobe. Thank you! I liked some of the other dresses too, but this was my fave by far. Love the purple and the lime green. It’s a very fresh and springy combination. Thanks! I love celebrating spring with bright colors. You look so lovely especially in the pic of your dress twirling in the wind, gorgeous. You did a great job translating that runway dress to a real life outfit! The purple and lime green is so gorgeous together! Your inspiration dress is so pretty, and I love that you played off the colours in your own outfit. They go together so well!